Asian dumplings are fun to make and to eat, and ready-made wrappers can be found in the refrigerated or frozen-food section of many supermarkets. Asian dumplings can be boiled, braised and browned in a skillet, or steamed. These are complemented by a spicy dipping sauce. 1. Make the filling: In a small saucepan, combine the mushrooms with water to cover (about 1 cup) and bring to a boil. Remove from the heat, cover, and let stand for 20 minutes, or until softened. Drain in a small strainer placed over a bowl, reserving the soaking liquid for soup. Spread the mushrooms on a clean kitchen towel and blot dry. Finely chop the mushrooms. 2. In a food processor, pulse the shrimp until finely chopped but not pureed. In a large bowl, combine the mushrooms, shrimp, pork, shallot, ginger, soy sauce, rice wine, sesame oil, garlic, sugar, and black pepper. Insert a chopstick or the round handle of a wooden spoon into the mixture and pull it straight across once or twice to mix the ingredients. Then use the chopstick or handle to stir the mixture gently in one direction until well mixed. 3. Have ready a small bowl of warm water. Line a rimmed baking sheet with parchment paper or waxed paper. Lightly flour a flat work surface, and lay a wrapper on the surface. Top the wrapper with a rounded teaspoon of the filling, placing it off center. Using your fingertip or a small brush, moisten half of the edge of the wrapper with the warm water. If using a round wrapper, fold it in half to make a half circle. If using a square wrapper, fold it in half to make a triangle. Pinch the center closed first. Using your fingertips, make 2 pleats on the front (side facing you) flap of the wrapper and press to close. (You can skip the pleats, see Tips, following). Alternatively, bring the corners of both sides of the bottom of the triangle together and seal. Stand the dumpling on the prepared sheet pan. Repeat to make more dumplings until you have used up all of the filling. As you put the dumplings on the sheet pan, make sure they are not touching, or they will stick together. If you have leftover wrappers, they can be frozen for another use. At this point, the dumplings can be frozen. Place them on a rimmed sheet pan lined with heavyduty aluminum foil and freeze solid, then peel them off the foil and store them in a resealable plastic freezer bag in the freezer for up to 2 months. Thaw before steaming. 4. Half fill a large skillet or sauté pan with water and bring to a boil. Add the cabbage leaves a few at a time and blanch for 1 minute, or until wilted. Using tongs, transfer 150 the leaves to a plate and let cool. Lay the cooled leaves in a single layer, overlapping them slightly, in the bottom of 1 or 2 bamboo steamers. Arrange as many dumplings as will fit comfortably, without touching, on top of the leaves. 5. Place the bottom of a steamer in a large wok and add just enough water so that the rim, but not the mesh, of the steamer touches the water. If using a second tier, place it on top of the first and cover it; otherwise, just press the top in place. Place the wok on the stove and bring to a boil over high heat. Reduce the heat to medium-high and steam the dumplings for 18 minutes. 6. Meanwhile, make the dipping sauce. In a small bowl, combine the soy, vinegar, water, and chile oil and stir to mix. Set aside in small serving bowls. 7. When the time is up, test the dumplings for doneness: Uncover the steamer, remove 1 dumpling, and cut it open. The filling should be cooked through and the dumpling light and tender. 8. To serve, slide the steamer (or each steamer) onto a round platter using a pot holder. Serve the dumplings directly from the baskets, and eat the cabbage leaves along with the dumplings. Either spoon the sauce over the dumplings once they’re served or place individual bowls of sauce on the table for dipping. The Many Ways to Wrap a Dumpling Dumpling wrappers are variously called dumpling skins, wonton wrappers, and gyoza wrappers. Examine them carefully before buying. 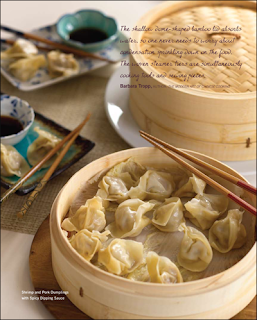 The thicker wrappers are good for boiled dumplings, whereas the thinner ones are better for steamed or fried dumplings. Although round and square wrappers are traditionally used for different fillings, they can be used interchangeably. Chinese steamed dumplings are typically pleated along their edges, so that the steam can puff them up without the delicate wrapper tearing. (If they do break open during steaming, you have probably used too much filling.) The pleating can be omitted in favor of simply pressing the edges together firmly; be sure you underfill the dumplings slightly, or they will break open while steaming. Or, look for a molded plastic dumpling maker, a hinged tool that pleats and presses a Chinese dumpling with one easy motion. Why Stir in One Direction? It may sound overly fussy, but stirring the dumpling filling in one direction is important. It blends the ingredients together thoroughly without compacting them, which is what happens if you stir them in more than one direction. Your filling will be lighter and more tender as a result. Apply this same technique to meat loaf, meatball, and pâté mixtures.